October was a busy month in the employee benefits world. The Internal Revenue Service (IRS) released final forms and instructions for 2018 ACA reporting. The Department of Health and Human Services (HHS) released inflation-adjusted civil monetary penalty amounts. The Treasury, the Department of Labor (DOL), and HHS released a proposed rule on health reimbursement arrangements. The IRS released a proposed rule regarding penalties for failure to file correct information returns or furnish correct payee statements. Congress and the President enacted a law to prohibit pharmacy gag clauses. The IRS released an information letter regarding dependent care assistance plan funds’ forfeiture. The IRS provided tax relief to victims of Hurricane Michael in Florida. The DOL released FAQs for plan participants affected by Hurricanes Florence and Michael. HHS released a proposed rule to require drug pricing transparency. The DOL and HHS released their regulatory agendas. The Internal Revenue Service (IRS) released instructions for both the Forms 1094-B and 1095-B and the Forms 1094-C and 1095-C and Forms 1094-B, 1095-B, 1094-C, and 1095-C. There are no substantive changes in the forms or instructions between 2017 and 2018, beyond the further removal of now-expired forms of transition relief. There is a minor formatting change to Forms 1095-B and 1095-C for 2018. There are dividers for the entry of an individual’s first name, middle name, and last name. Reporting will be due early in 2019, based on coverage in 2018. For calendar year 2018, Forms 1094-C, 1095-C, 1094-B, and 1095-B must be filed by February 28, 2019, or April 1, 2019, if filing electronically. Statements to employees must be furnished by January 31, 2019. All reporting will be for the 2018 calendar year, even for non-calendar year plans. Read more about the final forms and instructions. For failure to provide information identifying situations where the group health plan is primary, the maximum penalty increases from $1,157 to $1,181 per failure. For an employer who offers incentives to a Medicare-eligible individual to not enroll in employer sponsored group health that would otherwise be primary, the maximum penalty increases from $9,054 to $9,239. For willful or repeated failure to provide requested information regarding group health plan coverage, the maximum penalty increases from $1,474 to $1,504. Summary of Benefits and Coverage: For failure to provide, the maximum penalty increases from $1,105 to $1,128 per failure. Covered entity or business associate did not know (and by exercising reasonable diligence would not have known) that it violated the provision of the Administrative Simplification regulations. $114 to $57,051 for each violation, up to a maximum of $1,711,533 for identical provisions during a calendar year. The violation was due to reasonable cause and not to willful neglect. $1,141 to $57,051 for each violation, up to a maximum of $1,711,533 for identical provisions during a calendar year. The violation was due to willful neglect, but the violation is corrected during the 30-day period beginning on the first date the liable person knew (or by exercising reasonable diligence would have known) of the failure to comply. $11,410 to $57,051 for each violation, up to a maximum of $1,711,533 for identical provisions during a calendar year. The violation was due to willful neglect and the violation is not corrected as described in Tier 3. $57,051 minimum for each violation, up to a maximum of $1,711,533 for identical provisions during a calendar year. The adjustments are effective for penalties assessed on or after October 11, 2018, for violations occurring after November 2, 2015. Read more about the proposed rule. The Internal Revenue Service (IRS) released its proposed rule relating to penalties for failure to file correct information returns or furnish correct payee statements. The proposed rule contains safe harbor exceptions that apply in circumstances when an information return or payee statement is otherwise correct, is timely filed or furnished, and includes a de minimis dollar amount error. A dollar amount error is a de minimis error if the difference between any single amount in error and the correct amount is not more than $100, or, if the difference relates to an amount of tax withheld, it is not more than $25. Generally, when the safe harbor exception applies to an information return or payee statement and the return or statement is otherwise correctly and timely filed or furnished, no correction is required and, for purposes of Sections 6721 or 6722, the document is treated as having been filed or furnished with all of the correct required information. The proposed safe harbor exception would apply to information reported on the Forms 1094/1095, Form W-2, and Form 1099-R.
Public comments are due by December 17, 2018. Congress and the President enacted the Patient Right to Know Drug Prices Act (Act) that prohibits any restriction on a pharmacy’s ability to inform customers about certain prescription drug costs. penalizing the pharmacy for informing an enrollee of any difference between the enrollee’s out-of-pocket prescription drug cost under the plan or coverage and the amount that the enrollee would pay for the prescription drug without using any health plan or insurance coverage. The Internal Revenue Service released Information Letter 2018-0027 (Letter) to confirm that a participant’s dependent care assistance plan (DCAP) funds can be forfeited if a participant does not timely submit documentation of dependent care expenses. The Letter explains that, although the Treasury’s regulations do not specify a length of time for submitting expenses, the cafeteria plan document should specify the deadline for submitting expenses. The Letter also explains that the plan administrator should apply the deadline to all participants on a uniform and consistent basis. A cafeteria plan must operate according to its written plan or the employees’ elections between taxable and nontaxable benefits are includible in the employees’ income. Victims of Hurricane Michael that took place beginning on October 7, 2018, in Florida may qualify for tax relief from the Internal Revenue Service (IRS). The President declared that a major disaster exists in Florida. The Federal Emergency Management Agency’s major declaration permits the IRS to postpone deadlines for taxpayers who have a business in certain counties within the disaster area. Last month, the IRS extended deadlines for victims of Hurricane Florence in certain counties of North Carolina, South Carolina, and Virginia. The Department of Health and Human Services (HHS) released its proposed rule that would require direct-to-consumer television advertisements of prescription drugs and biological products to include the Wholesale Acquisition Cost (WAC or list price) of that prescription drug or biological product. The advertising requirement would only apply to prescription drugs and biological products that cost $35 or more per month and for which reimbursement is available, directly or indirectly, by Medicare or Medicaid. To enforce the advertising requirement, the proposed rule would require HHS to maintain a public list that identifies prescription drugs and biological products that are advertised in violation with the rule. HHS would post this list on the Centers for Medicare & Medicaid Services (CMS) website at least annually. The Department of Labor (DOL) released its regulatory agenda and the Department of Health and Human Services (HHS) released its regulatory agenda. Each agenda provides a list of regulations that the agency is currently working on, including rulemaking stage, to help employers anticipate potential change in certain areas of employee benefits. Q: What is the status of the Form 5500 proposed rule, that if adopted as a final rule, would generally apply for plan years beginning on or after January 1, 2019? A: Although the Department of Labor (DOL), Internal Revenue Service (IRS), and Pension Benefit Guaranty Corporation (PBGC) proposed Form 5500 filing changes in 2016, the agencies have not released any final rules regarding Form 5500 filing. At the American Bar Association’s ERISA Basics National Institute in October 2018, a DOL representative unofficially said that, due to President Trump’s Executive Order, the DOL has some other higher priority items that the DOL needs to address before it can address the Form 5500 proposed regulations. The DOL representative also unofficially said that it’s likely that new proposed Form 5500 regulations would be issued to allow for another round of public comment. However, the DOL representative didn’t have a timeline on when the additional proposed regulations might be released. The Internal Revenue Service (IRS) recently increased the annual contribution cap for participants of 401(k) and other retirement plans. Read this blog post to learn what the new contribution caps are. Participants in 401(k) and other defined contribution retirement accounts will see their annual contribution cap raised from $18,500 to $19,000 in 2019, according to the Internal Revenue Service. The catch-up contribution limit on defined contribution plans remains unchanged at $6,000. Savers with IRAs will see the annual contribution cap raised from $5,500 to $6,000 — the first time the cap on IRA deferrals has been raised since 2013. The annual catch-up contribution for savers age 50 and over will remain at $1,000. Single contributors to Roth IRAs will see the income phase-out range increase to $122,000 to $137,000, up $2,000 from last year. For married couples filing jointly the range will increase to $193,000 to $203,000, up $4,000 from last year. More low and moderate-income families may be able to claim the Saver’s Credit on their tax returns for contributions to retirement savings plans. The threshold increases $1,000 for married couples, to $64,000; $48,000 for head of households, up $750; and $32,000 for singles and single filers, up $500 from last year. The deferred compensation limit in defined contribution plans for pre-tax and after-tax dollars will increase $1,000, to $56,000. And the maximum defined benefit annual pension will increase $5,000, to $225,000. Do you have a communication plan for open enrollment? Once businesses have their plan changes locked in, it’s time to focus on communicating those changes to their employees. Continue reading to learn how to create a strong communication plan for open enrollment. Ready or not… the Benefits Super Bowl is here! Whether you are a broker, benefits manager or anywhere in between, you have been knee-deep on plan updates, rate reviews and benefit changes for months. Now that the plan changes are locked, it’s go-time! The focus is now on communicating and educating employees about their benefit options. It takes an enormous amount of planning and execution to provide a productive open enrollment experience for employees. But, it is well worth it as this is often the only time during the year that employees stop to consider their benefit options. What is the feedback you received from employees (the good, the bad and the ugly)? What were the most common questions? Were there key pieces of information employees had difficulty finding? Learn from the answers to these questions and then craft your content in a clear and concise manner that is easier for employees to digest. Now that you’ve developed the content to communicate, the next equally important step is determining how, when and where you deliver this information. Is there a centralized location where employees can find information for both core and voluntary benefits? Is the information in a format that the employee can easily share with his or her significant other? It is critical to have multi-channel communications to reach your audience. Some employees may naturally gravitate to a company-wide email and the company intranet, while others lean on more interactive mediums like E-books, text messages, webinars or lunch and learns. Providing a variety of communication avenues ensures you are reaching employees where they want to receive information. Make sure your communications campaign provides educational materials at each of the key milestones during the open enrollment journey–such as prior to enrollment, midway through enrollment, and right before enrollment closes. Wherever possible, always support employees through the process and give them options to reach out for help. You are likely communicating to a group of employees with diverse needs and wants. What may be appealing to an entry-level recent grad may not resonate with a senior-level employee nearing retirement. For example, employees with young children may be especially interested in accident insurance or pet owners might look to pet insurance to help offset the costs of well-visits and routine care. If possible, tailor your communications to different segments of the employee population. Core medical benefits are what employees gravitate to during the enrollment period. Are you offering voluntary benefits to employees? The most successful voluntary benefit programs are positioned next to core medical plans on the enrollment platform. This shows employees how those voluntary benefits (critical illness, accident insurance and hospital indemnity) complement the core offerings with extended protection. When voluntary benefit programs are positioned as an integral part of the employee benefits experience, employees are more likely to understand the value and appreciate the support provided by their employer. For example, a critical illness program can help to bridge the gap of a high-deductible health plan in the case of a covered critical condition. Communicate that voluntary benefits can be an integral part of a “Total Rewards Package” and can contribute to overall financial wellness. Finally, don’t miss your opportunity at the end of enrollment to review how your communication campaign performed. Pull stats and analyze your communication campaign for next year’s open enrollment… it is never too early to start! HR managers can glean valuable information and metrics from the employee experience. A recent industry report revealed that U.S. companies spent over $90 billion on employee training and development activities in 2017. Read this blog post to learn more. According to one industry report, U.S. companies spent over $90 billion dollars on training and development activities in 2017, a year-over-year increase of 32.5 %. While many experts emphasize the importance and benefits of employee development — a more competitive workforce, increased employee retention, and higher employee engagement — critics point to a painful lack of results from these investments. Ultimately, there is truth in both perspectives. Training is useful at times but often fails, especially when it is used to address problems that it can’t actually solve. Many well-intended leaders view training as a panacea to obvious learning opportunities or behavioral problems. For example, several months ago, a global financial services company asked me to design a workshop to help their employees be less bureaucratic and more entrepreneurial. Their goal was to train people to stop waiting around for their bosses’ approval, and instead, feel empowered to make decisions on their own. They hoped, as an outcome, decisions would be made faster. Though the company seemed eager to invest, a training program was not the right way to introduce the new behavior they wanted their employees to learn. Given these systemic issues, it’s unlikely a training program would have had a productive, or sustainable outcome. Worse, it could have backfired, making management look out of touch. Learning is a consequence of thinking, not teaching. It happens when people reflect on and choose a new behavior. But if the work environment doesn’t support that behavior, a well-trained employee won’t make a difference. Here are three conditions needed to ensure a training solution sticks. 1. Internal systems support the newly desired behavior. Spotting unwanted behavior is certainly a clue that something needs to change. But the origins of that unwanted behavior may not be a lack of skill. Individual behaviors in an organization are influenced by many factors, like: how clearly managers establish, communicate, and stick to priorities, what the culture values and reinforces, how performance is measured and rewarded, or how many levels of hierarchy there are. These all play a role in shaping employee behaviors. In the case above, people weren’t behaving in a disempowered way because they didn’t know better. The company’s decision-making processes forbid them from behaving any other way. Multiple levels of approval were required for even tactical decisions. Access to basic information was limited to high-ranking managers. The culture reinforced asking permission for everything. Unless those issues were addressed, a workshop would prove useless. 2. There is commitment to change. Any thorough organizational assessment will not only define the skills employees need to develop, it will also reveal the conditions required to reinforce and sustain those skills once a training solution is implemented. Just because an organization recognizes the factors driving unwanted behavior, doesn’t mean they’re open to changing them. When I raised the obvious concerns with the organization above, I got the classic response, “Yes, yes, of course we know those issues aren’t helping, but we think if we can get the workshop going, we’ll build momentum and then get to those later.” This is usually code for, “It’s never going to happen.” If an organization isn’t willing to address the causes of a problem, a training will not yield its intended benefit. 3. The training solution directly serves strategic priorities. When an organization deploys a new strategy — like launching a new market or product — training can play a critical role in equipping people with the skills and knowledge they need to help that strategy succeed. But when a training initiative has no discernible purpose or end goal, the risk of failure is raised. For example, one of my clients rolled out a company-wide mindfulness workshop. When I asked a few employees what they thought, they said, “It was interesting. At least it got me two hours away from my cubicle.” When I asked the sponsoring executive to explain her thought process behind the training, she said, “Our employee engagement data indicated our people are feeling stressed and overworked, so I thought it would be a nice perk to help them focus and reduce tension.” But when I asked her what was causing the stress, her answer was less definitive: “I don’t really know, but most of the negative data came from Millennials and they complain about being overworked. Plus, they like this kind of stuff.” She believed her training solution had strategic relevance because it linked to a vital employee metric. But evaluations indicated that, though employees found the training “interesting,” it didn’t actually reduce their stress. There are a myriad of reasons why the workload could have been causing employees stress. Therefore, this manager’s energy would have been better directed at trying to determine those reasons in her specific department and addressing them accordingly — despite her good intentions. If you are going to invest millions of dollars into company training, be confident it is addressing a strategic learning need. Further, be sure your organization can and will sustain new skills and knowledge by addressing the broader factors that may threaten their success. If you aren’t confident in these conditions, don’t spend the money. Representatives from the United States, Mexico and Canada recently reached an agreement to update the North American Free Trade Agreement (NAFTA). The new trade deal, referred to as the United States-Mexico-Canada Agreement (USMCA), includes a number of changes to support North American businesses, increase labor regulations and overhaul intellectual property (IP) protections. Starting in 2020, vehicles will only avoid tariffs if at least 75 percent of their parts are made in North America (up from the current 62.5 percent requirement). Also, at least 30 percent of the work done during the manufacturing process must be done by employees with hourly wages of $16 or more. Although these changes should help to discourage overseas imports, some believe that they could significantly increase the price of vehicles. The new deal has stricter regulations to protect trademarks, copyrights and other strategic plans. The USMCA also extends copyright protections to 70 years beyond the life of the author. One of the USMCA’s provisions allows for a special dispute process that’s handled by a panel of representatives instead of one of the three country’s court systems. An automatic review process will take place six years after the three countries ratify the deal, and it will automatically dissolve after 16 years. NAFTA will remain in effect until all three countries approve the USMCA, which is likely to occur sometime in early 2019. Congress and President Donald Trump recently approved the Disaster Recovery Reform Act (DRRA), an overhaul of the federal government’s approach to disaster preparation and risk reduction. The new law gives businesses, federal agencies and state governments more flexibility when requesting and using federal grants. Before now, the Federal Emergency Management Agency (FEMA) had strict regulations about how it distributed funds during a recovery process. Grants were usually used to help replace lost property, but didn’t account for improvements to help prevent future disasters. In fact, one of the biggest reasons that the National Flood Insurance Plan (NFIP) is over budget and in need of reform is that it’s common for a single property to flood frequently and make multiple insurance claims. 6 percent of the federal disaster budget will be put into a pre-disaster mitigation account every year. State governments, businesses and communities can apply for grants to fund risk mitigation activities. Rebuilding that uses federal funds will use strengthened building code requirements to protect against future incidents. Improving public utilities will also be a priority in order to ensure access to clean water and electricity. The president will be able to reimburse up to 75 percent of a state or local government’s disaster mitigation efforts to ease the strain on federal agencies. According to FEMA, every $1 put into planning for disasters can help save $6 during the recovery process. Contact us today at 920-921-5921 for toolkits, articles and other resources your company can use to prepare for various disasters and ensure the continuity of your business. The USMCA includes changes to support North American businesses, increase labor regulations and overhaul IP protections. When is a Workers’ Compensation Claim Compensable? Carefully evaluating workers’ compensation claims is crucial in helping your company save money and prevent fraud. Workers’ compensation is simply a form of insurance that offers employees medical coverage in the event they are injured during a work-related function. Depending on the state of residence, it may also give compensation for disabilities sustained or cover rehabilitation costs so the employee can return to the workplace quickly and smoothly. Compensable workers’ compensation claims have specific characteristics that will help you determine if and when an injury is covered. Workers’ compensation is crucial to protecting employees, but it is often a source of contention among employers because it comes with considerable gray areas. When is a claim compensable? How do we identify a fraudulent claim? How do we report a claim, and should we report all workplace injuries no matter how serious? This piece is designed to help you determine when—and if—an injury is covered by workers’ compensation. The first requirement is in place to ensure it is your employee filing the claim, not an independent contractor or vendor who works for themselves or a third party. Even if the incident occurs on your property, unless it is someone who works directly for you, the claim is not compensable. Injury is not the only thing that can potentially be covered by workers’ compensation. Illnesses could also qualify as a compensable claim, but only if they are related directly to the job. The illness also must be caused directly by the working conditions to be covered in a workers’ compensation policy. For example, a miner’s contraction of black lung would be compensable in all states. However, an employee in an office with a co-worker who smokes would not be eligible for workers’ compensation for treatment of illness due to secondhand smoke. This requirement means there must be a direct connection between the injury and the desire or attempt to further the employer’s business. If the employer benefits in some way, whether monetarily or otherwise, from the employee’s activity, then the claim meets this qualification. The employee must be at work when the injury occurs. This includes any place or location mandated or expected by the employer. So when an injury occurs at the employee’s physical everyday work site, that employee must prove he or she was injured while actively engaging in the furtherance of the employer’s business. There is a special provision called the “coming and going rule,” which maintains that benefits are denied for injuries received when traveling to or from work. Additionally, injuries arising out of transit from one work site to another, for instance when traveling to visit clients, are compensable. This provision also requires that the actions leading to the injury of the employee in question be prompted by the aspiration to further the employer’s business interests. The injury or illness in question must cause the employee to be impaired in some way and lose wages from not being able to complete his or her tasks completely. It is also a compensable incident if the injury or illness results in impairment but without lost wages, or vice versa. If any of these red flags occur, it by no means makes the claim automatically fraudulent. These are simply guidelines to keep employers proactively evaluating the legitimacy of a workers’ compensation claim. Are you currently designing your 2019 wellness programs? This year, employers must decide which approach to take on program incentives without EEOC guidance. Read this blog post to learn more. Employers designing 2019 wellness programs must decide what approach to take on program incentives without Equal Employment Opportunity Commission (EEOC) guidance on the Americans with Disabilities Act (ADA) and the Genetic Information Nondiscrimination Act (GINA). The commission has a Notice of Proposed Rulemaking tentatively slated for January 2019. Last year, the U.S. District Court for the District of Columbia decided the commission's 2016 ADA and GINA wellness regulations were arbitrary and vacated them, effective Jan. 1, 2019. Employers again are "in the uncomfortable position of not knowing with certainty whether and to what extent they can use incentives as part of a wellness program that involves medical examinations, disability-related inquiries and/or genetic information," wrote Lynne Wakefield and Emily Zimmer, attorneys with K&L Gates in Charlotte, N.C., in a joint statement. The Society for Human Resource Management (SHRM) "has long advocated for proposals that will ensure consistency between the wellness rules that the EEOC has jurisdiction over, the ADA and GINA, with those provided under the ACA [Affordable Care Act]," said Nancy Hammer, SHRM vice president, regulatory affairs and judicial counsel. "While EEOC's 2016 rulemaking effort adopted the ACA's 30 percent incentive, it added new requirements that would have discouraged employers from providing wellness options for employees. We are hopeful that the EEOC is able to revisit the rules to ensure both consistency with existing rules and flexibility to encourage employers to adopt innovative programs to improve employee health and reduce costs." Employers have long sought guidance over whether and when wellness program incentives—rewards or penalties for participating in biometric screenings and health risk assessments connected with the programs—comply with the ADA and GINA. The ADA prohibits employers from conducting medical examinations and collecting employee medical history as part of an employee health program unless the employee's participation is voluntary, noted Ann Caresani, an attorney with Tucker Ellis in Cleveland and Columbus, Ohio. GINA prohibits employers from requesting, requiring or purchasing genetic information from employees or their family members, unless the information is provided voluntarily. The EEOC in 2000 asserted that for a wellness program to be voluntary, employers could not condition the receipt of incentives on the employee's disclosure of ADA- or GINA-protected information. However, in 2016, the commission issued regulations providing that the use of a penalty or incentive of up to 30 percent of the cost of self-only coverage would not render involuntary a wellness program that seeks the disclosure of ADA-protected information. The regulations also permitted employers to offer incentives of up to 30 percent of the cost of self-only coverage for disclosure of information, in accordance with a wellness program, about the manifestation of a spouse's diseases or disorder, Caresani said. Biometric screenings for employees and spouses. Disability-related inquiries directed at employees, which might include some questions on health risk assessments. Family medical history questions, such as risk-assessment questions that ask about the manifestation of disease or disorder in an employee's family member and/or such questions about the disease or disorder of an employee's spouse. Any other factors that involve genetic information. The AARP challenged the 2016 rule, arguing that the 30 percent incentives were inconsistent with the voluntary requirements of the ADA and GINA. Employees who cannot afford to pay a 30 percent increase in premiums would be forced to disclose their protected information when they otherwise would choose not to do so, Caresani explained. While the 30 percent cap was consistent with the Health Insurance Portability and Accountability Act (HIPAA) as amended by the ACA, the AARP said this was inappropriate, as HIPAA and the ADA have different purposes, noted Erin Sweeney, an attorney with Miller & Chevalier in Washington, D.C.. In addition, the change from prohibiting any penalty to permitting one of 30 percent was not supported by any data, according to the AARP. In the summer of 2017, the U.S. District Court for the District of Columbia held that the EEOC's rule was arbitrary. The court sent the regulations back to the EEOC for further revisions. In December 2017, the court vacated the 2016 rule after the EEOC initially said that the new rule would not be ready until 2021. No incentives (most conservative approach). These types of wellness programs can still include biometric screening and health risk assessments that employees and spouses are encouraged to complete, but no rewards or penalties would be provided in connection with their completion. Modest incentives (middle-ground approach). A modest incentive is likely significantly less than 30 percent of the cost of self-only coverage, given the court's finding that the EEOC did not provide adequate justification for an incentive level up to 30 percent. Up to 30 percent incentives (more aggressive approach). Although the court did not rule that a 30 percent incentive level would definitely cause a wellness program to be considered involuntary, incentives at this level after 2018 likely will expose employers to lawsuits, they wrote. One good way to demonstrate compliance, they noted, is a multiple-point program in which participants engage in different activities and earn an incentive by participating in enough activities apart from biometric screenings, risk assessments or providing their spouse's health information. For example, an employer could let employees take health care literacy quizzes or offer a program that measures a worker's activity as opposed to fitness, Caresani noted. She said, "Programs that are participatory are probably less effective than outcome-based programs, but they are more popular with employees and are less likely to pose litigation risks." What is your definition of data? New approaches to data science allow companies to have many different definitions of data and have them all coded. Read on to learn more. Did you know how to handle employee requests for time off to go and vote last Tuesday? Laws related to voting leave varies between states, leaving some employers questioning how they should address employee requests. Read on to learn more. Many employees will be eligible to cast their ballot on Nov. 6, but will they have time to vote? Some states require employers to give workers time off to vote, and even in states that don't, some businesses are finding other ways to get employees to the polls. With Election Day around the corner, employers should be mindful that, while no federal law provides employees leave to vote, many states have enacted laws in this area, said Marilyn Clark, an attorney with Dorsey & Whitney in Minneapolis. Depending on the state, employers may have to give workers notice about their voting rights and provide paid or unpaid time off to vote. 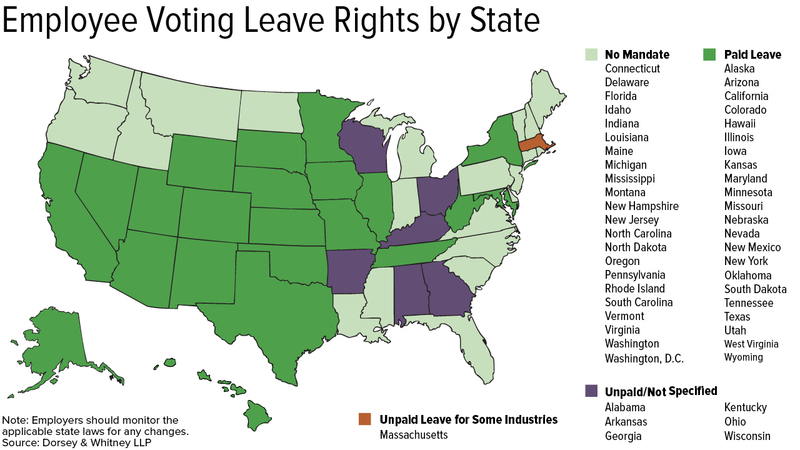 Even in states where there is no voting leave law, it is good practice to let employees take up to two hours of paid time off to vote if there isn't enough time for the employee to vote outside of working hours. "Encouraging and not discouraging employees should be the general rule," said Robert Nobile, an attorney with Seyfarth Shaw in New York City. "Here in the United States, too many people don't vote because they don't have time due to jobs, child care and other responsibilities," said Donna Norton, executive vice president of MomsRising, an organization of more than 1 million mothers and their families. "Getting to the polls can be especially challenging for people in rural communities [or] single-parent households, and those who are juggling multiple jobs." About 4 in 10 eligible voters did not vote in the 2016 presidential election, according to research conducted by Nonprofit VOTE and the U.S. Elections Project. And voter turnout has been historically lower for midterm elections, such as this year's, which are held near the midpoint of a president's four-year term, according to Pew Research Center. "Businesses can help solve this problem by making sure that all employees have paid time off to vote," Norton said. Some employers are offering solutions by making Election Day a corporate holiday, offering a few hours of paid time off for employees to vote and giving employees information about early and absentee voting, according to TheWashington Post. Giving employees time off to participate in civic or community activities tends to improve worker performance, said Katina Sawyer, Ph.D., an assistant professor of management at George Washington University. Employers who are offering paid time off to vote will likely reap the benefits through improved employee attitudes and performance. Employers in states with voting-leave laws should be familiar with the specific requirements, as some state laws have a lot of details. Even in states without such laws on the books, employers should check to see if there are any local voting leave ordinances in their cities. Employers required to give workers time off to vote should plan for adequate work coverage to ensure that all employees can take time off, Clark said. In many states, the employer may ask workers to give advance notice if they need time off and may require that workers take that leave at a specific time of the workday. In some states where leave is paid, employers might have the right to ask employees to prove they actually voted. Most states prohibit employers from disciplining or firing an employee who takes time off from work to vote. "Ultimately, fostering an environment that generally encourages employees to exercise this important right is a good practice to mitigate the risk of a potential retaliation claim," Clark said. Although state laws vary, "the general theme across the U.S. with respect to voting laws is that employees will be given time off to vote if there is insufficient time between the time the polls open and close within the state and the time employees start and finish work," Nobile said. "Typically, two to three consecutive nonworking hours between the opening and closing of the polls is deemed sufficient." Some state laws provide unpaid leave to vote or do not address whether the leave must be paid. Oregon and Washington no longer have voting leave laws because they are "vote-by-mail" states. In some states, such as California and New York, employers must post notices in the workplace before Election Day to inform employees of their rights. Employers might have to pay penalties if they don't comply. The consequences for denying employees their voting rights can be harsh, with some states even imposing criminal penalties, Clark noted. At a minimum, employers should adopt a policy spelling out the voting rights available to employees under applicable laws, Clark said. For businesses that operate in states that don't have a voting-leave law, employers may still wish to adopt a policy outlining their expectations about time off for voting. Multistate employers may elect to adopt a single policy that includes the most employee-friendly provisions of the state and local laws that cover them. "By taking this approach, employers avoid the administrative burden of adopting and promulgating multiple policies for employees working in different locales," Clark said. All voting-leave policies should be sure to include strong anti-retaliation provisions, which make clear that the employer will not take any adverse action against employees for exercising their voting rights. "It's important to remember that the law sets the floor," said Bryan Stillwagon, an attorney with Sherman & Howard in Atlanta. "Companies with the happiest and most-engaged employees recognize that positive morale comes from doing more than what is required." Dana Wilkie contributed to this article. Did you know: Millennials are more likely to look for another job than any other generation in the workforce. This creates a golden opportunity for employers to recruit those employees. Read on to learn more. Millennials with jobs are more likely to be looking for a new job than any other generation in the workplace, according to a Harvard Business Review article by Brandon Rigoni and Amy Adkins. They report that six in ten millennials are ready to jump ship at any given time. This is a challenge for keeping workers, but it’s also a golden opportunity for recruitment. For the most part, these are bright workers who are deconstructing the great American job search. Firms can seize this opportunity by honing their HR brand to appeal to younger generations and balancing this with assessments that assure a good match with most new hires. Compensation is still important, but millennials are looking for jobs that are in sync with their values and can help define who they are. Getting hired has become a matter of personal identity. As an employer, you are being evaluated more than the candidates. How will your firm make the cut? And if you do, will you hire the right people? Major corporations have overhauled their approach in the scramble for talent. General Mills began using virtual reality headsets to allow candidates to see themselves working inside General Mills, including using the company’s gym. Two Volvo engineers recently built a Baja racer for collegiate competitions to attract young engineers to the legacy truck builder. General Electric’s humorous “What’s the Matter with Owen” television campaign said bupkis about GE products. Instead, Owen touted the company’s geek chic HR brand as a bespectacled new employee being effusive about his job of programming life-changing technology to help people. McDonald’s eschews traditional media to engage 16 to 24-year-old candidates via Snapchat, offering “Snaplications” and video clips of young McDonald’s employees talking about their jobs. Not everyone can serve up cold brew coffee in a corporate cafeteria. Still, there are practical steps most firms can take to enhance their HR brand for millennial and Gen Z values. Does your organization operate with a high degree of transparency? Is it socially responsible? Do employees have paid leave for volunteer work? Are young team members valued and encouraged to contribute to relevant and visible projects and products? Are there ways to present your products and services to be more relevant and important to society? For example, a textile manufacturer might not actually make exciting products anyone can buy, but its fabrics are used in the space program or to save lives in emergency rooms. Maybe a law firm has a pro bono clinic for low-income families. Yes. HR needs to make your employer brand attractive to these talented but fickle job seekers, but this doesn’t mean that everyone who’s attracted to your organizational hipness is going to be cool for your company. There are two tools to make sure both parties get what they want. The first is assessments. Talent acquisition assessments greatly improve your odds of hiring an individual who is well matched to your company’s needs. The best are scientifically valid and EEOC compliant, focusing on the candidate’s motivation and likely work traits as compared to the job description. You’ll save a lot of money in not having to re-hire for a position. The second tool is the “Shared Success Model,” which is a process hiring managers can establish that aligns individual development plans with organizational strategies to identify where overlap exists and where there may be gaps. Individual needs—What is important to the candidate, both professionally and personally? What aligns with their values and interests? Individual offer—What value does the organization bring to the candidate? Company needs—What does your organization require for success now and in the future? What do you need from your leaders and employees? Company offer—What is your corporate value proposition to the candidate? What opportunities do you provide? What culture do you provide? Plan—Analyze the gaps and overlap between each quadrant. Develop and implement a plan that balances your grid for shared success. As younger candidates seek more of a cultural match, the Shared Success Model is a good way to make sure the culture you promise is a culture that supports your mission and business model.